This past weekend, I braved bridges and tunnels and drove down to the Perry Library at Old Dominion University, to retrieve this review. Curiously, ODU has a full run of The Bell magazine (1940-1954) on microfiche. The Bell was a literary review and survey of contemporary life in Ireland, founded in 1940 by Peadar O'Donnell, and later edited by Sean O'Faolain. It is still regarded as one of the most important Irish magazines of the twentieth century, counting among its contributors such luminaries as Elizabeth Bowen, Michael Farrell, Patrick Kavanagh, Frank O'Connor, Liam O'Flaherty, and George Bernard Shaw. HAPPY AS LARRY is a play written in a manner which is to-day usually reserved for radio-features. It employs an intermittent narration by a group of commentators; the main action takes place in a series of inset scenes. This is a wearisome and mechanical enough device in radio; one rarely avoids the feeling that the author has lacked the energy or the invention to construct a convincing piece of fluent action. It strikes one as a lazy way of writing, even on the air. Off the air, it seems lazier still. It is true that the six tailors who provide Mr. MacDonagh's narration are lively enough in their stock way, and that eventually he fits them fancifully into the main action, but one is aware of contrivance throughout; and one suspects that an effort is being made to divert us from observing the thinness of the main theme. Feeling the keen blade sinking in. . . .
That is fine. 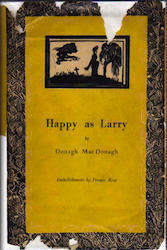 And, for what it is, Happy as Larry is very good; But what is it? It is this: A group of six tailors on a forestage are discussing marriage. Their remarks are not without a little of that roguish near-bawdiness about the pleasures of two-in-a-bed-o'-winter-nights, a little of which goes a long way (or else not far enough, I am sometimes perplexed to know which). One of them begins to tell the story of his Grand-da, Larry, who had two wives and never decided which of them was good and which was bad. We move back (inset) to Larry, a lusty young husband who discovers a young widow lamenting in a churchyard. She has just buried her husband; on his deathbed he has made her promise not to marry again till the clay is dry on his grave. When we first see her, she is fanning the grave in order to help things along. (This is one of those actions that only an Irish writer would accuse an Irish character of performing.) Larry takes her off home for a cup of tea. His own wife is the victim of the attentions of a Rossinian doctor; she spurns them, until, unbeknownst, he poisons Larry; then, to the astonishment and horror of the neighbours who have come to the wake, she yields to him. Here the tailors take a hand in the action: They poison the doctor. Seamus, the doctor's accomplice, urges Mrs. Larry to extract some blood from Larry's heart and pump it into the doctor. This she sets about doing. At the touch of the knife, however, Larry comes, rather dazed, to life again. Mrs. Larry falls dead. The tailors explain to Larry what has happened; he abjures regular unions forever, and announces his intention of becoming a ruthless sexual terror to the neighbourhood. He is dissuaded from this course by the widow whom he has found drying her husband's grave. All ends happily, and the tailors, having successfully adjusted the past by their timely incursion, return to the present Curtain. Is this a good story? Not very, I should say. Yet I have read the play twice, and do not think I have missed anything, except, possibly, the point. There is a good deal of briskness about the verse. The whole thing is the kind of thing one would happily put up with in an opera, for which, indeed, the play would provide an admirable libretto. Or, perhaps, the words might be cut entirely, and it might do very well as a ballet. In its present form, as it seems to an English reader, it is invincibly thin. Yet the English reader, cannot help feeling also, that perhaps he has missed something that an Irish reader would seize and applaud. Is the English reader being too Sophisticated? Or merely too naive? With the entire run of The Bell at my fingertips, I was sure to double-check for notes on the contributors, and to scan backward and forward several issues for another contribution by Reed. I didn't find anything more that he had written, but I did find a very short review of A Map of Verona, from June, 1946. I'm saving that for the next post!